Those who know medicine buy generics. 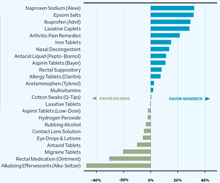 Generic drugs cost a fraction of national brands, but one in four consumers prefer brand names anyway. Chicago Booth researchers Jean-Pierre Dubé, Matthew Gentzkow, and Jesse Shapiro, working with Dutch economist Bart Bronnenberg, set out to investigate why. At CVS, 100 tablets of Bayer aspirin cost $6.29; the same amount of the CVS store brand cost $1.99. The products have the same dosage, the same amount of the active ingredient, and the same directions. What makes people choose the more expensive national brand when the generics are identical? Analyzing 77 million shopping trips from 2004 to 2011, the researchers found that people’s choices were influenced by their level of knowledge and field of expertise. Health care professionals more often preferred the cheaper generics. Pharmacists, for instance, bought the store brand 91 percent of the time, compared with 74 percent for the overall population. When it comes to buying pantry staples, medical professionals were no more likely than other consumers to choose generic brands: “Healthcare expertise does not translate to behavior outside the health domain,” the researchers note. Their findings were published in a July National Bureau of Economic Research working paper. When do medical professionals buy generics?